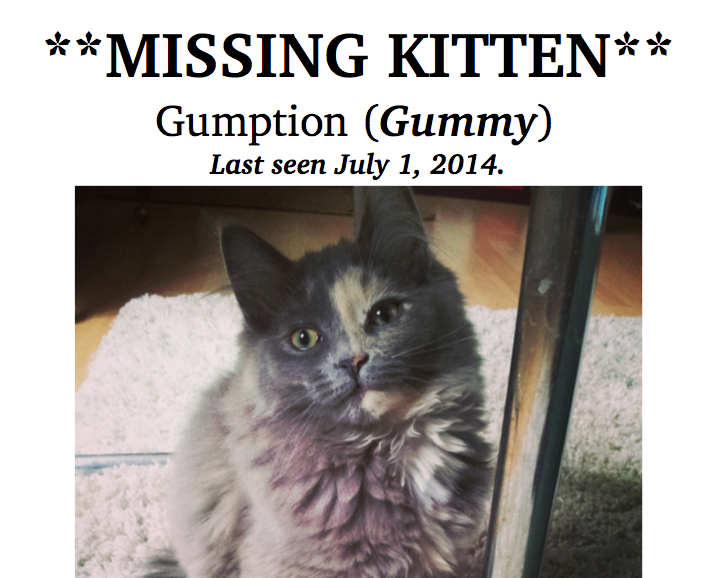 Yesterday around 1pm, Jenny asked me if I had seen Gumption. I figured, as was her nature that she had probably just gone up for her mid-day snooze under my bed. By 3pm, Jenny asked again after checking under my bed and not being able to see her. Therein started 4 hours of searching the house, backyard, neighbourhood frantically for the little one. It included “missing cat” signs posted throughout the hood, tears and a whole host of emotional labour. I cracked open a can of Virtute’s favourite meal “Rabbit Dinner” and scooped a likely too large scoop into his bowl, just to hear the trilling notes of Gumption’s wake up voice as she staggered out of Maggie’s room and into the kitchen for dinner.